Set in 1840's New Orleans, this historical novel traces the journey of the community of free people of color who were feared and ignored by whites. Suspended between worlds of blacka nd white, finding stability only int their own community, they live in tension and ambiguity that form their greatest strength and their greatest weakness. The protagonist is a 14 year old boy named Marcel with one white and one free black parent. Together with his sister and two close friends they deal with the transition of adolescence and its mirror in the ambiguity of their social position. Marcel awakens when his idol, a famous novelist and free man of color comes to New Orleans to open a school. Marcel has been promised an education by his rich white father and Marcel intends to make it at Christophe's school. Meanwhile, his sister Marie is being courted by a prosperous and respected friend of Marcel's, but her vulnerability and the plans of other jeopardize her happiness. Marcel is making his own journey to adulthood through relationships with Christophe and his family. When it is announced that Marcel is to learn a trade to support himself instead of finish academic study, Marcel rebels, is removed from school, and wanders seeking the truth about who he is and what he was meant to do. Discuss whether The Feast of All Saints a coming of age tale. How does it differ from most other tales that deal with the trials and tribulations of maturation? Marcel and Marie are the children of a French plantation owner, Philippe Ferroniare and his mistress, Cecile. Discuss the father son relationship between Marcel and Philippe. How does this relationship differ from most other father son relationships in mid-1800 New Orleans? At what age was Marcel baptized? For the 1840’s, is this a common age for New Orleans Catholics to receive their baptism? Who are the gens de couluer libres? Describe their social existence. What has history forgotten about them? What most surprised you about the gens de couluer? Who is Christophe? What is his profession? What sort of person is he? Does Christophe encapsulate the Byronic hero or does Marcel? Discuss the relationship between Christophe and Marcus. Who is Anna-Belle? Discuss the relationship between her and Marcus. What effects do these two characters have on Marcus? What does Jean Jacques offer the young Marcel? What specifically is a quadroon? What is the etymology of this word? Madame Elisie Calvi�re recalls the days before the Louisiana Purchase, when New Orleans was a French colony and then ruled by the Spanish Empire. Discuss the “Tignon Law” passed by Governor Esteban Mir� in 1785. Discuss the repercussions of this law. Though this law has long since been abolished, does some measure of this law evince itself in today’s day and age? Josette, Marcel’s aunt, informs him of his family’s experience of the African Diaspora, and she discusses with him the Haitian Revolution. Discuss the affect the African Diaspora had along the Cane River. What effects did the Haitian Revolution have on New Orleans slave trade? In what ways does the Haitian Revolution differ from the Slave Revolt of 1811 New Orleans? Rice relies greatly on historicity to propel the plot of Feast Of All Saints. For example: A quadroon is free to study the revolution of photography. Etc. Do these historical events help drive the plot and overall themes of the novel? In what way(s) does Rice’s historical research enable the reader to empathize with the protagonist and other characters? Which religion is the norm in 1840 New Orleans? What distinguishes this religion from the religious celebrated along the Cane River? What is the commonality and distinction between the two faiths? Discuss whether Rice’s research has portrayed these religious practices well. Lisette leads Marie to the house of a voodooienne. How is Voodoo different from the spiritual practice of the Creoles? How is Voodoo different from Hoodoo? Discuss the divergence of Louisiana Voodoo from Haitian Voodoo. Why does Rice find it necessary to include Louisiana Voodoo in this novel? Is Rice’s attitude toward the Civil War reflected in this novel? Discuss her attitude toward slaves in contrast with the free people of color. Is there a greater sympathy shown toward one or the other or both equally? How did this novel change your view of black history before the civil war? Who is the local madam? Discuss why Marie would seek refuge under the roof of Dolly Rose. Cecile is the mistress of Phillippe Ferronaire. Anna Bella is Vincent Danzicourt’s mistress. Marie is assaulted by five men and is then betrothed to Richard as a result. Discuss some of the various dispositions men have toward women in this book. 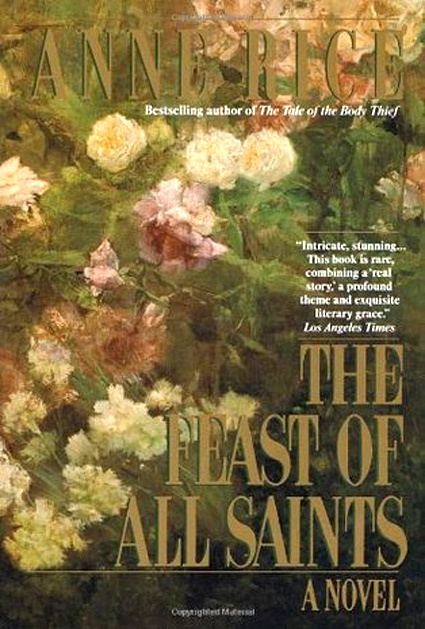 This novel is entitled The Feast Of All Saints. Discuss why Rice would associate this novel with a celebration of the Roman Catholic Church on the first of November. Who are the saints of this novel? What kind of saints are they? Martyrs? Virgins? Holy men and women? How does screenwriter, James Wilder, adapt the novel?� Anne has claimed he is the most faithful adapter of her work. Do you agree? Wilder expanded the role of Dolly Rose for the mini-series. Was he faithful to the character and the work? Does Ben Vereen faithfully capture the vigor of Rudolph Lermontant?